Corruption case launched over reconstruction of ill-fated Kemerovo mall | Russian Legal Information Agency (RAPSI). 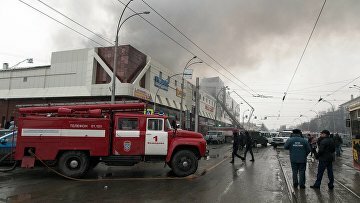 MOSCOW, November 1 (RAPSI) – Investigators have launched a criminal case over bribery during reconstruction of Zimnyaya Vishnya (Winter Cherry) shopping mall’s building in Kemerovo that became a site of deadly fire in March 2018 leaving 60 people dead, the press-service of the Russian Investigative Committee has stated. According to investigators, in 2013-2014, head manager of Kemerovo confectionery factory Vyacheslav Vishnevsky through the mediation of Viktor Yefimkin gave a 7-million-ruble bribe ($107,000) to the chief of the State Construction Inspection for Kemerovo Region Tanzilia Komkova, her son Eduard Komkov and CEO of ISK Resource company Nikita Cherednichenko. The bribe was designated for help in favor of Vishnevsky. Komkov and Cherednichenko have already been charged with bribery. Investigators seek detention for both defendants as well as Vishnevsky. Due to the fact that the latter left Russia in 2016 investigators plan to put him on the international wanted list. The fire occurred in the mall on March 25. According to investigators, 60 people including dozens of children were killed by fire. Initially it was reported that 64 people died. Investigation was completed into seven defendants in the case, Yulia Bogdanova, CEO of the Kemerovsky Confectionary Combine, a company owning the mall, technical director of the mall’s owner company Georgy Sobolev, the mall’s manager Nadezhda Suddenok, a guard who allegedly turned off the emergency notification system when he received a fire signal Sergey Antyushin, CEO of the company System Integrator that developed the fire safety system Igor Polozinenko; an employee of the company, who personally installed the fire alarm Alexander Nikitin and fire team commander Sergey Genin. Investigation into five other defendants is still ongoing. They are: the ex-director of the Emergency Ministry’s department for Kemerovo Region Alexander Mamontov, chief of the ministry’s directorate for Kemerovo Grigory Terentyev, chief of the region’s State Construction Inspection Tanziliya Komkova, the fire control service chief of the Federal Fire-Fighting Service’s regional department’s 1 team Andrey Bursin and Shengerei.